Camp Fun Fore All is a five (5) day camp held at Fun Fore All Family Fun Park in Cranberry Twp., PA. The camp is designed for children AGES 6-12. Throughout the camp, there will be a mix of educational and FUN activities, including arts & crafts, story time, educational speakers (Carnegie Science Center, Animal Tracks, The Gab Squad, etc. ), and park attractions (XD Dark Ride, Mini-Golf, Kiddie Rides, Rock Wall, Go Karts, Batting Cages, Ballocity, Arcade, & Bumper Boats). 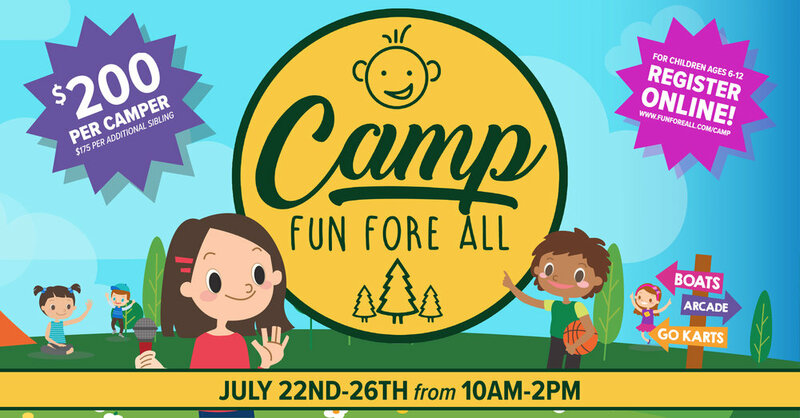 Each day of Camp Fun Fore All will have a specific theme (Science Fun Day, Amazing Animal Day, Awesome Acting Day, Christmas in July Day, & Fun Fore All Spirit Day). Lunch will be provided for the campers every day.